If you need to work in Moscow and you don’t have your own office, check out our list of trendy spots where students and freelancers can set up temporary shop for a minimal fee. Moscow offers freelancers ample opportunities for working. Some old-school introverts may prefer to bring their laptops or use one of the computer stations in one of Moscow’s libraries. The entrance is free, the atmosphere is quiet and books surround you as you type away. Extroverts generally like co-working spaces and anti-cafes (also known as time cafes): there is a fee (usually about 500 rubles or $10) for a day, but you will be working side by side with your peers – other creative freelancers. Included in the fee in co-working spaces is office equipment, whereas in anti-cafes guests enjoy coffee, snacks and fun activities. Several old libraries have already been turned into media centers where students and freelancers come to work. The best options are the Dostoevsky, Turgenev and Svetlov libraries. You must bring your passport, but there is free internet throughout the library. You can set up at a table, but also on a couch, get coffee from the nearby cafe or purchase sweets at the vending machine. As it’s a library there are free lectures, film screenings, readings, concerts, exhibitions and other events. In the Turgenev library there are also French and German language clubs, a lecture series on foreign literature, as well as film screenings in Russian, French and German. The purpose of co-working spaces is not just to provide freelancers with a desk and chair, but to create a startup community where participants share experiences, ideas and socialize. The trendiest co-working spot in Moscow is “Rabochaya stantsia” (Work Station) in Gorky Park. The cheapest is Club Nagatino. An inside tip: on the co-working website Start Hub and “Na kryshe” (On the Roof) you can register for a free trial day. In the co-working space VAO it is possible to receive free legal consultation and accounting assistance and there is also a special dedicated “quiet” zone, where no one can use their phone — a true luxury for those used to working in cafes. 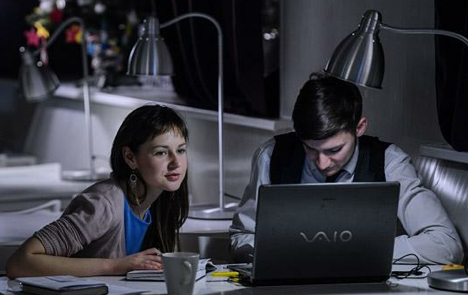 Below are the seven best co-working spots in Moscow. An anti-cafe is an establishment where you do not pay for things like coffee or tea, but to spend time there. People come here to play board games, watch movies, listen to lectures, work on presentations and other projects, make new friends or just use the Wi-Fi while drinking coffee or tea. The primary difference of an anti-cafe from a co-working space is in that people go not only to work, but to relax. There is office equipment like in a standard co-working space, but also various games, projectors and other diversions. The work zone and play zone are generally separated. In the afternoon the majority of anti-cafes have film screenings, lectures, seminars or meetings. The first anti-café in Moscow was “Tsiferblat” (Clockface). The Wooden Door café is popular for those looking to communicate in foreign languages. The majority of anti-cafes forbid the consumption of alcohol, but in Happy People you can bring light drinks such as beer or wine (up to 15 percent alcohol). The majority of establishments provide coffee, tea and cookies, and in TimeTerria you can order fruit shakes and creative desserts. Additionally, in most anti-cafes you can bring your own food as well. Below are the five best anti-cafes in Moscow. Be sure to book a table as these are popular spots.